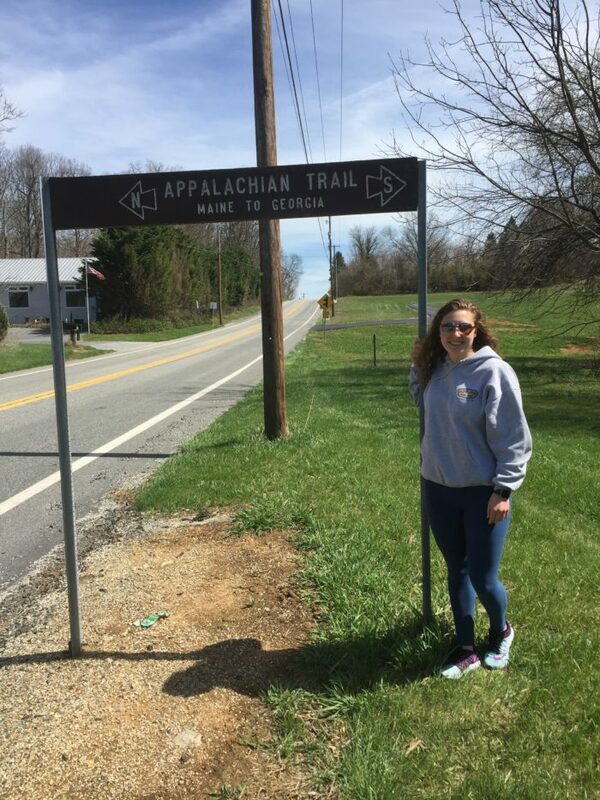 For those of you who aren’t familiar with the Appalachian Trail (A.T.), it is a hiking-only footpath running from Georiga to Maine and is roughly 2,190 miles. This is a picture of the first time I ever stepped foot on my future adventure. Growing up in New Jersey I’ve known about the Appalachian Trail for quite some time but it wasn’t until about 2 years ago that I knew thru-hiking the trail was “a thing”. That’s when the obsession started. The idea of thru-hiking was fascinating to me. I read countless blogs posts, numerous books and followed a ton of A.T. hikers on their quest to Katahdin (or Springer Mountain). But at this point, I was still in college and classified it as a bucket list item. My boyfriend and I were meeting my parents halfway between school and home to drop off my dog. We had a backpacking trip coming up and my parents generously offered to take care of their furry grandson for a few days. Well, this halfway point was Carlisle, PA and we were heading right from there to my boyfriends’ house in Maryland via PA-74 south. Well, for those of you that know all things A.T. you’re aware that the trail actually crosses over this highway. I was not aware of said crossing so you can only imagine my surprise when I spotted the sign. This was shortly followed by a “holy crap” freak out moment to my boyfriend sitting in the passenger seat and then a rapid and probably slightly dangerous U-turn. I have New Jersey plates, it’s acceptable to drive like a jerk. Right? The moment I pulled into the tiny parking lot and spotted my first white blaze I had this rush of butterflies in my stomach. I wasn’t quite sure how to express my excitement but it was such a physical reaction that in that moment I knew that my fascination with the A.T. needed to come to fruition – one day. I am now a college graduate and leaping into my next journey with both feet. I will be thru-hiking the A.T. northbound starting February 2018. All 2,190 miles of it! I would love to take each and every one of you with me on my adventure and will be sharing my experience via this awesome website called ‘The Trek’. I’m sure you’re all wondering why the hell I would give up my warm bed, my handsome furry pup and my loving family and friends to live in the woods for approximately 5-6 months. Well, we’ll get into that next time. Hi, Friends! I'm Lexi, a 23-year-old recent college graduate and I will be embarking on my NOBO thru-hike of the A.T. starting in February 2018. I'm a craft beer enthusiast, a crazy dog mom, an avid Mountaineer football fan and a book nerd. Oh and donuts. I love donuts! Follow me on my great adventure! I am envious. And, yes, I would like to follow you on your adventure of a lifetime! So COOL! (& smart) I cannot wait to see and read all about your progress. I have two college friends who did the AT(plus many other they trails). Good for you! And kudos for not putting it off until later in life. Start later. You are likely to hit snow in the southern mountains, in particular the Smokies. I did when I began my through hike years ago in late Feb.
Good luck! I can’t wait to here all about your preparation, planning, gear, food etc… Keep us posted. LESY!!!!! so excited for you and cannot wait to read and hear all about it!! !